The American Recovery and Reinvestment Act (recovery funds), signed into law on February 17, 2009, presents an extraordinary opportunity to strengthen Utah’s clean energy economy and create new green jobs across the state. The State Energy Program (SEP) will be the recipient of $40 million that will be directed towards energy efficiency, energy conservation, and renewable energy projects and programs in an effort to promote clean energy technologies as well as create jobs for Utahns. SEP is preparing for the influx of recovery funds and will work diligently to manage this responsibility to the taxpayers and the public. Information pertaining to SEP’s implementation of the federal recovery funds will be periodically updated on the following Web site: geology.utah.gov/sep/stimulus. Unlike many states, Utah is blessed with its own diverse array of energy resources. Fossil fuels, like coal and natural gas, have been used for a century or more to heat our homes, power our lights, and build a thriving community and industry. Due to local resource abundance and decades of developing an energy infrastructure (i.e., power plants, pipelines, and transmission), Utah’s energy rates are among the lowest in the nation. Utah’s inexpensive electrical energy production and consumption portfolio is fueled primarily by coal and natural gas. However, in today’s energy policy and planning landscape, it is common practice to diversify energy portfolios in order to mitigate several growing concerns—looming federal carbon dioxide emissions regulation and volatile market trends in the gas industry among them. Policymakers and utilities are predicting these two issues will affect the cost and reliability of energy in the years and decades ahead. Adding renewable energy to the energy portfolio is a hedge against future price increases that result from carbon-constrained markets and volatile fuel prices. In 2008, policymakers began to address this issue; Utah set a goal to have 20 percent of its adjusted electrical retail sales come from renewable energy by the year 2025. To help meet this goal, Governor Huntsman commissioned the Utah Renewable Energy Zones (UREZ) Task Force. The UREZ Task Force was directed to assess Utah’s utility-scale solar, wind, and geothermal resource potential and address other factors, such as transmission and generation costs, in order to understand what it will take to develop Utah’s renewable energy resources. Phase I of the UREZ initiative was designed to assess the location and quality of these resources, and the transmission and generation costs will be addressed in Phase II. Phase I was completed in January 2009 and identified an abundance of renewable energy resources. The Utah Geological Survey’s State Energy Program (SEP) was chosen to lead the Phase I investigation and analysis, and Rick Allis, director of the Utah Geological Survey (UGS), was appointed co-chair of the UREZ Task Force. With support and collaboration from the UREZ Task Force, UREZ participants, energy resource consultants, and the UGS, SEP developed a report that addressed all of the UREZ Phase I goals (available at geology.utah.gov/sep/renewable_energy/urez/index.htm). Utah’s total solar, wind, and geothermal renewable energy resource is great. Phase I identified over 13,000 square miles of energy zones totaling 837 gigawatts (GW) of generating capacity. To put this number into perspective, assume only 1 GW of each of the three resources is developed. Accounting for specific energy generation characteristics of each resource—solar and wind are intermittent resources and geothermal is a constant generating resource—the combined electrical energy output from 3 GW would produce enough power to light approximately 16 million homes. Although Utah is unlikely to develop 837 GW capacity in the foreseeable future, it puts into perspective the potential contribution of the state’s renewable energy resources, even if only a fraction of the resource is developed. It is clear from Utah’s sunny climate that its solar resource is robust. In total, the UREZ Phase I investigation identified 6,371 square miles of solar energy zones, which have a potential of 826 GW of generating capacity. Approximately 95 square miles located in the southern half of Utah are considered the highest quality with a generating capacity of 12 GW. While Utah faces a tough competitor in Wyoming, which has a world-class wind resource, Utah holds its own in wind power potential. The UREZ assessment identified approximately 9,145 megawatts (MW) generating capacity from 51 distinct energy zones covering 1,830 square miles. The greatest concentration of a high-quality wind resource, totaling over 2,500 MW, is located in Escalante Valley in Iron, Beaver, and Millard Counties. This area is already beginning to see significant wind development. 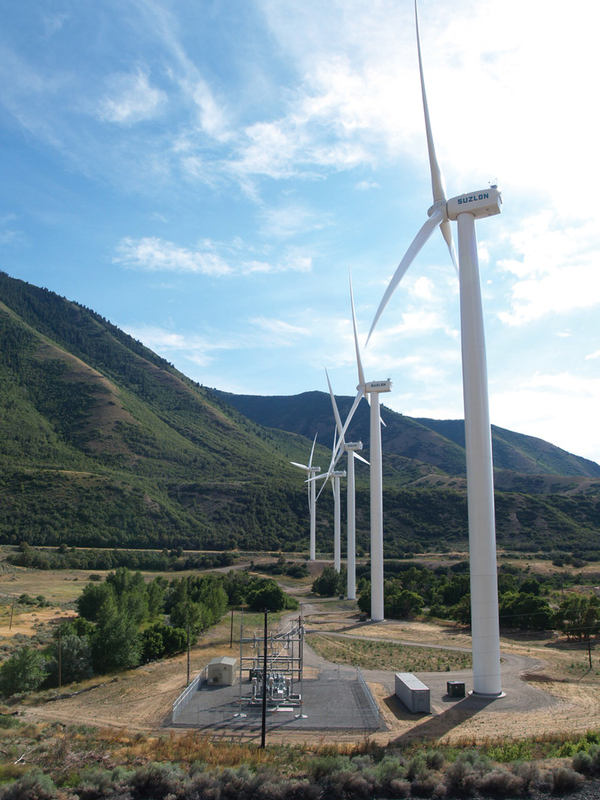 Utah wind resources are also geographically dispersed; 24 out of 29 Utah counties have identified wind energy zones. UGS geothermal geologist Robert Blackett co-authored the UREZ report’s section on Utah’s geothermal resources. The report found that Utah’s identified higher-quality geothermal energy zones exist in a 50-mile-wide strip along the I-15 corridor stretching from Iron County to Millard County. In addition, geothermal energy zones were identified throughout the western half of the state as far north as Box Elder County. The estimated potential for electric generation from geothermal energy zones is approximately 2,166 MW encompassing approximately 5,000 square miles. One of the significant findings of the UREZ study is that a high concentration of solar, wind, and geothermal resources are co-located in southwestern Utah, specifically in Iron, Beaver, and Millard Counties. By identifying the state’s utility-scale resources, Phase I creates a data foundation for analyzing new electrical transmission development, which would be required to deliver this renewable electricity to market. In addition, the UREZ process will help to identify which zones are economically feasible for development, and in turn may prioritize which transmission routes need to be upgraded or developed. In 2009, Phase II will continue to explore these critical issues, and SEP will provide continued technical support and consultation to assist the UREZ Task Force. Utah certainly has an opportunity to be a leader in renewable energy development. Its diversity and co-location of resources—such as solar, wind, and geothermal—make Utah attractive to energy markets throughout the West.